Given his worldwide reputation as a scientist, teacher and broadcaster, the wonderfully bushy eyed Robert Winston needs no introduction from the likes of me. 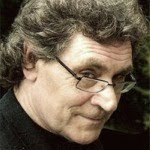 However, it is worth noting his current job description – Professor of Science and Society at Imperial college, London. This title is a brilliant trope to the emerging need for science to come down off the mountain of authority and specialisation, and begin taking part in the necessary political and cultural debates around where the best and worst of the human imagination is taking us. In short, though science may indeed be built on universal principles: nevertheless its priorities, and its outcomes go to the heart of how we treat our common inheritance – whether physical, social, economic, or intellectual – both in the present and for future generations. Or as Robert Winston would have it – though science creates knowledge, how we use it, whether for good or ill, is far from a given. 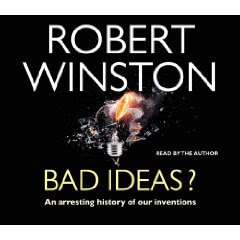 In his latest book, Bad Ideas, he examines all of the above by taking us on a wonderfully eclectic tour of five broad swathes of scientific inquiry and discovery. Firstly agriculture, and of how human imagination took flight when food was a planned and guaranteed activity. Second, how writing – born as an accountancy tool - for example measuring the granaries of ancient Egypt – leapt over its origins and became the de facto medium of intellectual progress. Third how fossil fuels emerged as the defining framework for economic transformation? And, finally how medicine and genetics takes us to the heart of what being human is and might become. In all of this he claims a downside – that writing is used for bigotry and persecution – that fossil fuel polices are ruining the earth – that genetics is heading out of control: in short, bad ideas are just as fertile as good, and it's time we all started taking more notice of the political impact of this paradox. As a project to help frame this debate the book is a great success. However, he does pack a lot in, and inevitably his treatment of specific themes - e.g. the potential of the Internet, feels at worse superficial, and at best a useful building block to his overall thesis that things could all turn pear shaped if we are not careful. As an approach to popularising science and the issues they raise this isn't necessarily a bad thing, even if, on occasion, it comes across a tad too tidy. Nevertheless, he writes well and the issues he raises essential to our future. Also worth sharing is Prof Winston's engaging memories, insights, et al into The London Natural History Museum, courtesy of the Creative Spaces project. Robert Winston - Natural History Museum from Creative Spaces on Vimeo.